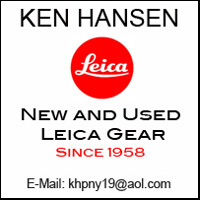 Even though news of new Leica products at this year’s Photokina were sparse compared to previous years, there was one bit of Leica news which received surprisingly little attention. That is the establishment of the new Leica Business Unit Professional. It covers the Leica SL and S line of cameras and lenses, the unsurpassed cine lenses of CW Sonderoptic, as well as as Sinar digital backs and tech cameras. This was done to better serve the professional users of these cameras, lenses and equipment, and it clearly shows Leica’s commitment to the professional photographer and the professional photography market. Stephan Schulz has been awarded the position of the global director of Leica’s new Business Unit Professional. He granted an interview with David Farkas of Leica Store Miami and gave some very interesting insight into this new venture by Leica Camera AG. Towards the end of Photokina, I sat down with Stephan Schulz, the global director of Leica’s newBusiness Unit Professional. We talked about what this new professional business unit would mean for customers, product development, the future of the S-System, and more. Basically, the new business unit is now responsible for S and SL systems, CW Sonderoptic / Leicacine lenses, as well as Sinar digital backs and tech cameras. My impression is that this organizational change is a significant one, not just a name change. The professional division will enjoy some level of autonomy from the rest of the company. I received quite a few requests while I was in Germany to find out if Leica would be abandoning the S-System, with all the recent focus on the SL. The answer from Schulz was a resounding “no.” Leica is fully committed to supporting and developing both the S and SL systems for the foreseeable future. Of course, when you look at the numbers, the answer seems a bit obvious. The S (Typ 007) was launched just 15 months ago, not a long time for a flagship model. In that time, Leica has issued three major firmware updates for the S007, along with continued firmware revisions for the older S2 and S (Typ 006). The system has ten lenses, none of which require updating, as they are all stellar performers – some of the best medium format lenses available. The S007 has over 15 stops of dynamic range – the most of any still camera, shoots 3.5 fps – the fastest of any MFD camera, is fully weather and dust sealed, and features Wi-Fi, GPS, 4K video, and the best ergonomics available. The only shortcoming for some users is the resolution of the S. Compared to 50, 60, 80 and 100 MP models from other manufacturers, some find the S007’s 37.5 MP somewhat lackluster. Of course, there are reasons that Leica decided to stay at this resolution (checkout my article for a full explanation), but they acknowledge that users are demanding a resolution bump. Based on Schulz’s comments, I feel that Leica has heard its customers’ request and will eventually release an updated body with more resolution. It is far too soon to guess at specs for the next generation S, or to speculate on a release date. Clearly, an update is still a ways off. Another issue that I addressed was the future of service for professional products. Schulz seemed to indicate that this is also a top priority and is actively working to reduce turnaround times and build up a loaner pool for pro customers. Given the recent delays with repairs, this comes as welcome news. All-in-all, I get the feeling that S and SL shooters have a lot to look forward to. Check out the video for the full interview here.